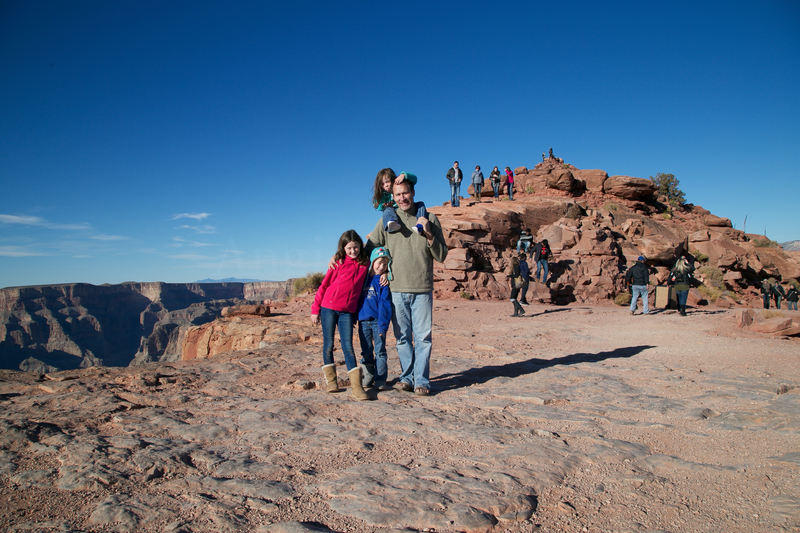 We ventured to Peach Springs, Arizona to see the western rim of the Grand Canyon with the kids on Saturday. It was both breathtaking and nerve-racking all at the same time. 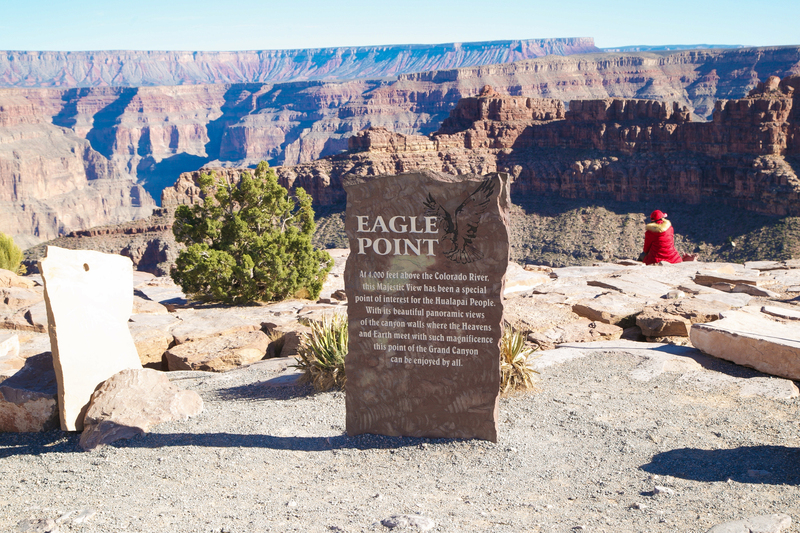 As a self-proclaimed airheaded clutz, with 2 out of 3 children who follow in their mother’s footsteps, the no barrier between the edge of the canyon and the 6,000 foot drop was enough to make me develop a severe case of the dreaded ‘what-if’ disease. I am no stranger to the disease, but it took hold of me on Saturday and seized all of my rational thoughts. My mind kept running through different scenarios. For example, at one point Greg was walking along the rim looking down into the abyss. Two other ladies were walking towards him also looking down into the void. They were talking and not really paying attention and that’s where my imagination kicked into high-gear and all of a sudden, I saw Greg side-stepping the ladies in an effort to avoid a head-on collision, but the girls lost in their own world, became startled and also began to step to the side…causing Greg to lose his footing and just sort of tumble off the side of the canyon. He didn’t of course, but like I’ve stated before, my imagination is very vivid. There was another scenario where Phoebe was being herself and jumping on and off the rocks trying to avoid the cracks. several times, she came very close to the edge and in my mind, the story went something like this: There she is, Phoebe jumping from one rock to another and with all of her gusto and curiosity, she runs right up to the edge. Not realizing the depth of what lies beyond the canyon wall, she just sort of forgets to stop running and runs right off the canyon. News paper articles flash through my mind with titles saying: ‘Little Girl Risks Everything’ ‘The Little Girl Who Couldn’t Stop”Little Girl Leaves Without Goodbye”Christmas Won’t be the Same for RV Family”Mother Flings Herself over the Side of the Canyon to save her daughter’…and they just kept coming. With my palms sweating, I became the “Girls, please don’t do that” “Can you just walk in a straight line Phoebe” “Phoebe stay with me” “Phoebe hold onto the stroller and don’t let go” mom on Saturday. I kept asking myself, “If it were just Greg and I, could I then relax?” The answer was very clear. Absolutely not. I would be equally afraid of my own clumsiness and mis-steps. Like those stories I used to read about people who do things to ‘self-sabatoge’ themselves, I could just envision myself accidentally slipping to my death. All those nightmares I had as a child of falling down stairs and off the side of very high structures laid the foundation for a true fear of heights. Not to mention, the horror of letting go of someone I love and not being able to at least try to save them would haunt me forever. And there’s no way my 5’6″ frame could save my 6’3″ spouse. Maybe if something magical were to transpire and I could surpass the height and weight differentiation between us…like maybe my love for him would allow me to gain all this strength and lift him, with one arm from the edge, and bring him to safety. But then I think about the 12 pound dumbbell I carry in my gym bag that I can barely do 12 reps with…and subsequently manage to dissolve the dream on the spot. Plus, I’m not a big believer in magic. So no matter what, I was way out of my comfort zone. Abby is a lot like me…very curious, but equally cautious. She, like me, didn’t go near the edge. We maintained the safe distance of at least 1 yard from the edge of death. 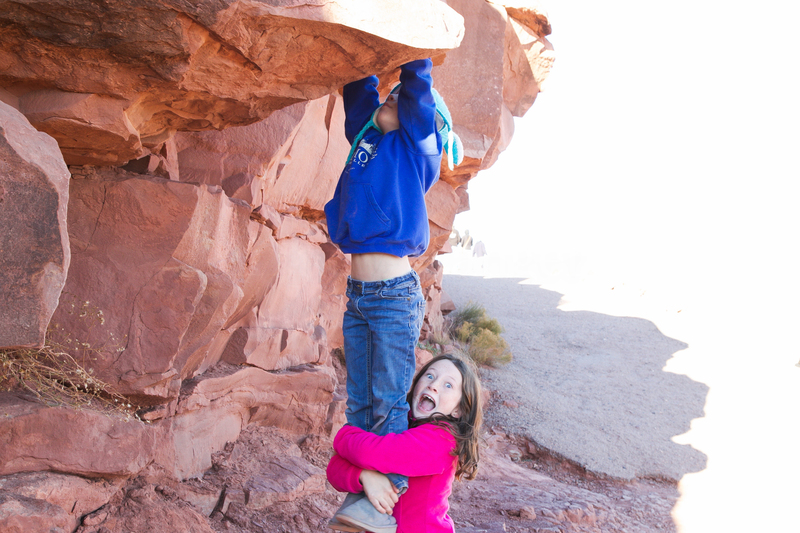 Then of course there’s the more adventurous/daring/risk taking side of our family: Phoebe and Greg. Phoebe would run right up to the edge and jump, laugh and peek over…I couldn’t handle the over-active stories going on in my mind. Honestly, if I didn’t develop an ulcer that very day, it was a true miracle. Greg was equally brazen with his constant pleads for Abby and I to come to the edge. “You’ve got to be kidding me?” I kept saying, “Can’t you just love me for who I am…instead of trying to turn me into someone you wish I was?” Seemed like a rational question to me. To appease him, if that’s possible in this scenario, I agreed to walk the famous “sky walk”. Even the skywalk was way out of my comfort zone, but I thought it might quell his desires to see his wife do something out of the safety of her little bubble. It didn’t. He continued to pester me throughout our visit. 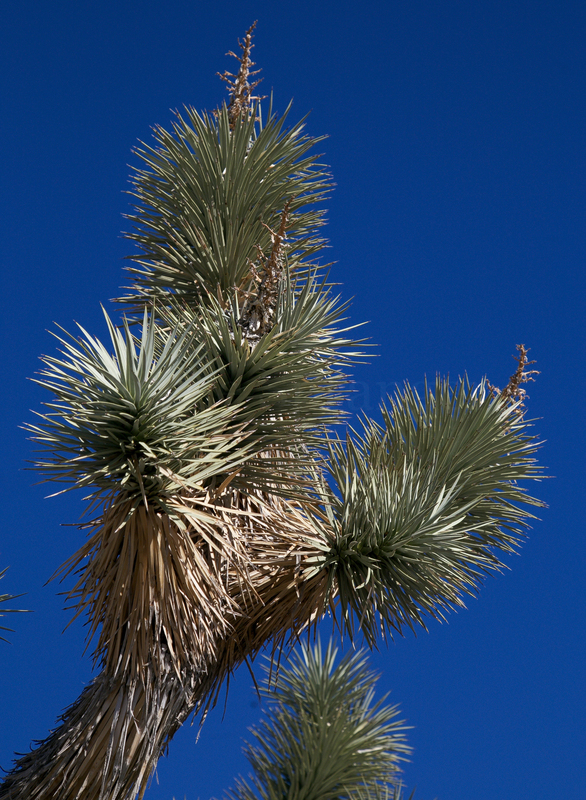 With all of the vast harrowing depths, I cannot deny the magnificence of this natural feature of our landscape. 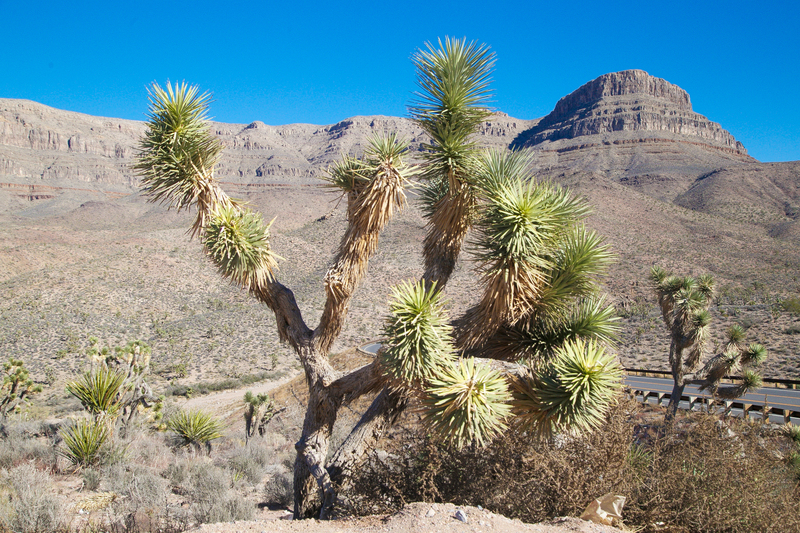 After 3 hours of braving the 43 degree weather to visit the 3 areas of the western rim, we stopped for some lunch. 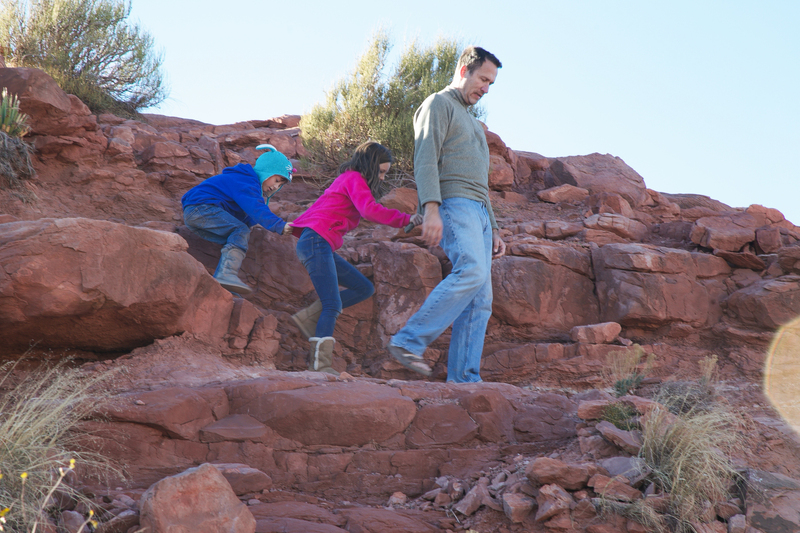 Greg, Abby, and Phoebe wanted to climb the “anthill” so they could have a 360 degree view of the canyon. And then it would be time for us to head home. Cecilia and I sat at the base of the hill ready to take a picture of that special moment when Greg and the girls would wave to us from the summit. When I heard Greg’s voice echoing, “No Phoebe, come here”, my heart sank to my stomach. Moments later, they were making their way to our picnic table with a story of “Phoebe was crawling around up there and actually crawled underneath a man’s legs” Greg said rolling his eyes. “Time to go”, I proclaimed. A feeling of absolute relief came over me and in that moment, I was thankful we were all able to witness the magnificence of the Grand Canyon together. We hiked the treacherous mile back to the bus stop and I watched as Abby and Phoebe chased each other around the poles of the bus top. I would have asked them to stop, but there wasn’t anyone else around and frankly, I was tired of hearing myself repeat the word, “No” all day long. It was right in that moment, two men came around the corner. Somehow, Phoebe, who was not watching where she was going, ended up right in front of one of the men as he was walking toward the bus stop. He tried to move to the side in an effort to avoid her. Completely unaware of her surroundings, she continued her twirling and ended up moving to the side as well. He was desperately trying to avoid her and damn near ended up falling. It was only when I yelled out at her to, “Watch where you’re going Phoebe” that she realized what was happening. She finally stopped in front of the man and he stumbled out of her net of confusion. Apologizing profusely, I took Phoebe by the arm and sat down with her on a nearby bench. I bowed my head, took a breath, ignored Phoebe’s constant, “Mommy are you mad at me” questions, and counted to 25. 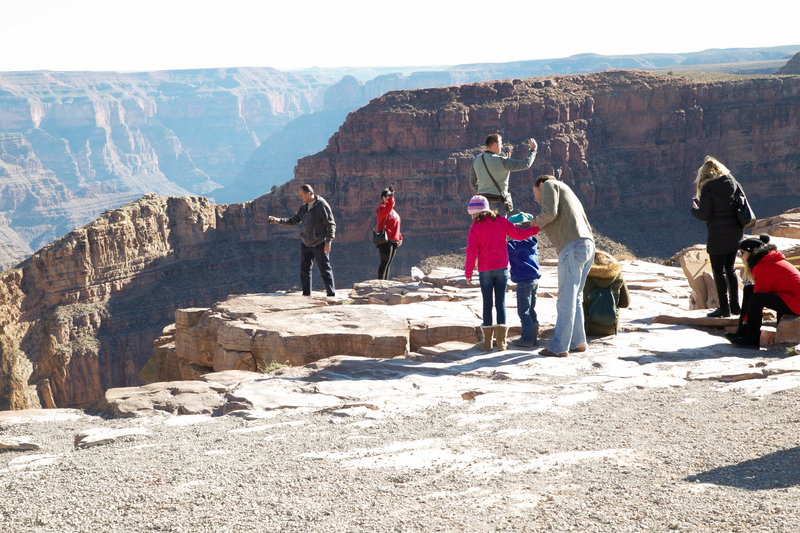 On our ride back to the Visitors Center, Greg was asking the girls what their favorite part of the Grand Canyon was. 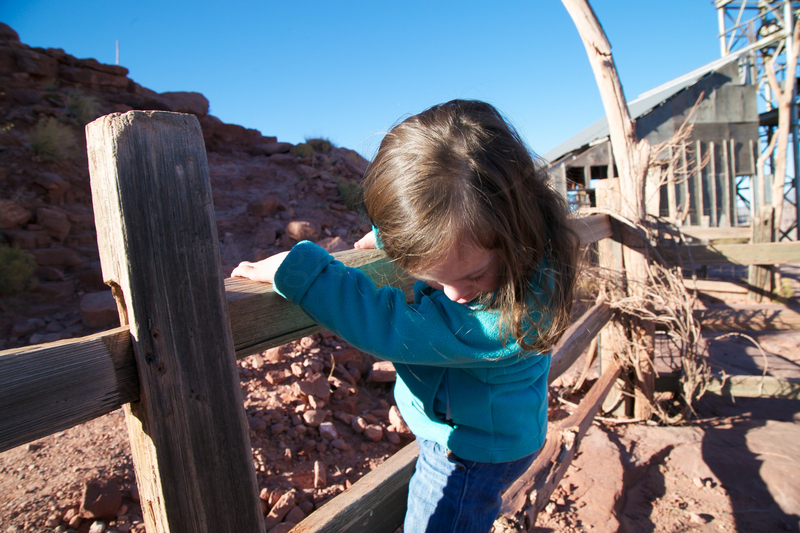 Abby said, “climbing all the cool rocks and seeing everything” was her favorite thing. 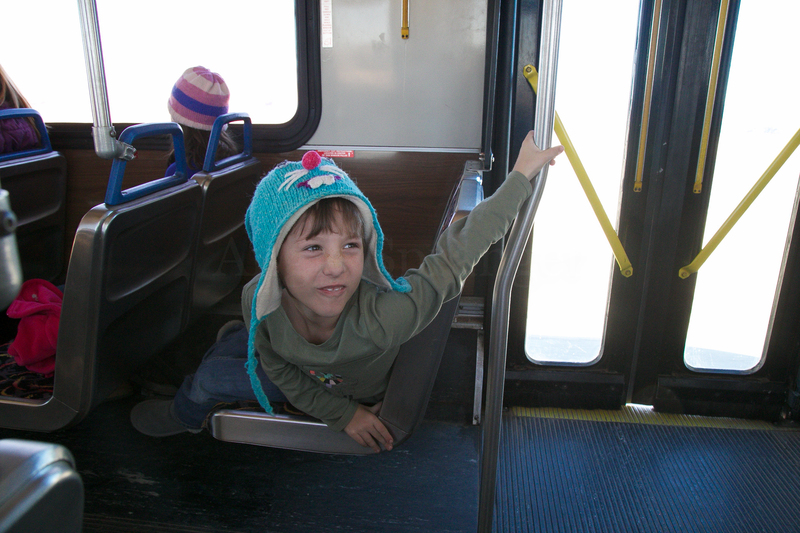 Phoebe proudly proclaimed, “It was my very first time riding a bus, so riding the bus was my favorite part.” And there you have it. Riding a bus to the Grand Canyon surpassed seeing the actual canyon.